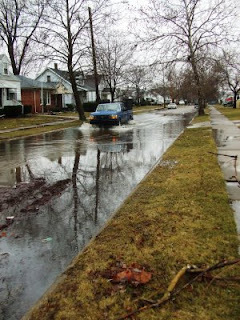 Southeastern Michigan was once again hit with heavy rainfall that flooded streets, stranded motorists and caused problems throughout the region. Mayor Mike Duggan released a report this evening that broke down how the city government has responded to this crisis. The information below represents the City’s response as of 5 p.m. Agencies will continue to respond to flooding as long as needed. Residents who would like to report water and sewer emergency issues can call (313) 267-7401 or use the Improve Detroit - SeeClickFix” mobile app for Apple and Android devices. More than 275 flooded street drains have been fully cleared by City agencies. The Mayor's Office released the following numbers to break down exactly how they have responded. Through morning and afternoon hours, DDOT experienced minimal service interruptions. However, routes were behind schedule due to traffic and flooding issues. For the evening commute, DDOT will have its normal deployment level on the road. They will work to keep delays to a minimum.